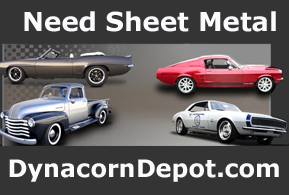 The following is a list of parts required to convert an I6 ’67-’68 Mustang to a V8. Unless otherwise noted, the parts listed are for V8 ‘Stang application. Fortunately for ’67 and ’68 owners, the I6 ‘Stangs shared more parts with the V8s than the ’65-’66 Mustangs. All p/s suspension parts including Drag link (not sure about Pitman arm), inner and outer tie rods, tie rod adjusters, idler arm, idler arm bracket to fram, p/s hoses, p/s pump, control valve, and power ram. Trans yoke should be the same. Drag (center) link. ’67/’68 I6 non-p/s same as V8 non-p/s and I6 p/s same as V8 p/s. LH and RH inner and outer tie rods and tie rod adjusters are the same between I6 and V8 regardless of p/s or non-p/s. Idler arm. ’67/’68 I6 non-p/s same as V8 non-p/s and I6 p/s same as V8 p/s. Kick down cable. ’67 same; ’68 unknown. Clutch pedal to equalizer (Z-bar) push rod, Clutch pivot (engine and frame side), clutch pivot felt washers and balls, clutch return spring, and clutch rod from Z-bar to clutch fork are the same. Pitman Arm – Necessity of replacement unknown at present. ’67 was a transistion year in that some steering boxes had a 1″ sector shaft while others had 1-1/8″ shaft. I think there was no correlation whether or not the steering box had the continuous steering shaft or the rag joint. Pretty sure the I6 p/s Pitman arm is the same as the V8 version but not 100%. More research is in order. I wouldn’t recommend changing to the continuous steering shaft design if your “stang is equipped with the rag joint style unit. Two front hub and brake assemblies including hoses. Stainless Steel Brake Corp offers original Kelsey-Hayes 4-piston front disc brake set up using the same spindles the V8 drum brakes use for the ’67s and for the single piston caliper ’68s, SSBC include the spindles in their disc brac conversion kit. ’67 hubs are available new but status of ’68 hubs is unknown. Rear differential assembly ’67 or ’68 ‘Stang 8″ diff. or ’77-’80 Lincoln Versailles/Merc Monarch/Ford Granada (LMF) bolts in. Axle to axle face distance on the V/M/G rear may be close enough to not matter with the ’67/’68s. Rear axle brake lines and hose that are attached to the rear differential assembly. Emergency brake cable to rear brake drums: ’67 I6 may be same as ’67 V8 but ’68 I6 different from ’68 V8. Pick the part which matches the year of your Mustang. Pair of 10″x 1-3/4″ (coupe or fastback for sure not sure with Convertibles) rear drum brake assembly (your on your own if you have a 9″, LMF have rear disc but parts are obsolete). Engine (duh!) Don’t forget the ground wire that goes from the passenger side cylinder head to the firewall. Radiator. If your V8 has a driver side output water pump you can bolt on a passenger side exit pump. Then you will have to hassle with getting all the accessory pulleys to line up. An alternative is get a radiator shop to mod your radiator to accept the driver side outlet water pump. If you get a donor motor, beware that some ’65 and earlier 289s had a different timing cover to match the early style water pump. Upper and lower radiator hose. ’66 – ’72 smallblock V8 motor mounts LH, RH. You can reuse the alternator but you will need to get the correct alternator brackets to mount it (depending on other engine accessories). Most folks seem to get the engine fully dressed so already have the alternator, water pump, pulleys, and fan parts. Depending on whether you’re installing a/c or p/s you will have to find appropriate pulleys that line up. Note all 289s and 302’s made up to ’69 had a three bolt crank pulley while 302s after ’69 had 4 bolts. ’67/’68 Fan and fan spacer or clutch fan if your V8 engine didn’t come with them. Beware, earlier or later fans and fan spacers or clutch fans vary in length and diameter. Exhaust manifolds (or headers), exhaust pipe, muffler(s) and tail pipe(s)+ hangers. Note: If you live in a state which requires emissions testing, you will need to get the appropriate smog equipment in order to pass. YMMV check your state’s rules for guidance. Caveate: In California, ’73 and older vehicles are exempt from bi-annual smog check but the legislation SB42 did not allow for any tampering or removal of smog equipment. If autotrans, you can use the 6 cylinder’s C4 (unless your V8 is modified for more power) but you must change the block plate and bell housing for one that will bolt to a V8. Note: Very early ’65 260-289s used 5 bolt bell housings and the ’65 and later engines were 6 bolt. You will also need the V8 flexplate and torque converter. Warning: After ’81 all 302s used 50 oz imbalance on their flexplate/flywheel and the harmonic balancer is different from the pre ’81 harmonic balancer. Also, ’70 and later C4s had larger input shafts so match the torque converter to the trans. Don’t forget the trans cooling lines. One last thing, if you’re changing to an C4, make sure it’s one from a car that had a floor shift selector and not one on the column. The shift lever on the trans (and I think the internal rod) are different. Don’t forget the Auto trans torque converter access plate. If manual you can use the I6 3 speed (same as V8 starting in ’67) or better yet a 4 spd toploader. You will need the engine block plate, clutch bell housing, flywheel, clutch disk, pressure plate, throw out bearing, pilot bearing, dust boot, clutch fork to fulcrum retainer, and clutch fork. Or you could chose clutch cable conversion. See Vintage-Mustang.com (www.Vintage-Mustang.com) and search their forum regarding clutch cable conversion. See above auto trans info regarding 5 bolt vs 6 bolt engine blocks and correct flywheel imbalance. Regardless of trans choice, you will need the appropriate front/rear U joints and possibly drive shaft. Note: ’67/’68 I6 or V8 with AT used same U joints. Not sure if drive shaft is the same. Four bbl 289 V8 used different U joints than I6 or 2 bbl V8 Mustangs. Speedo cable. Test fit cable from I6 to see if it will work with new trans (if applicable). If not, consult Friendly Neighborhood Mustang Parts Place for advice. Don’t forget to get the correct speedo gear for the application. The gear fro an AT is different from one for a Manual trans. Set of five lug rims (don’t forget the spare – Doh!). Grab 4 extra lug nuts, too. Engine gauge feed wiring harness. This harness includes the oil and temp sending unit wiring plus the wires that go to the coil.Note: Be sure to buy the correct harness depending whether your Mustang is equipped with factory A/C or if you didn’t have an in dash tach but replaced your instrument cluster with one which does. Alternator wiring harness – different if your Mustang is equipped with the factory in dash tach. Starter cable from solenoid. The 6 cyl’s negative battery cable may be a bit long but may be useable on a V8 – critical part is the terminal lug that is bolted to the block. 6 cylinder’s may have a smaller bolt hole. Accelerator pedal bell crank assembly. Manual Transmission: Bellcrank assembly is same from ’65 through ’68 for V8 Mustangs. Automatic Transmission: Bell crank assembly is same from ’66 through ’68 (has the kick down arm which the kick down cable attaches to). The V8 throttle rod ( the link between carb throttle shaft and the accelerator pedal assy) is different than the I6 bell crank linkages. ’67s use the same throttle rod as the ’65/’66s. “68 is unknown. Fuel line. Yup the entire hard line. You’re going to get vapor lock if you use the 6 cylinder’s. Two (2) “289” or “302” badges for your fenders. Hey, if you went through all that trouble to drop in a V8 you might as well advertise it. If you dropped in a 351 or other you’re on your own (except for 390).